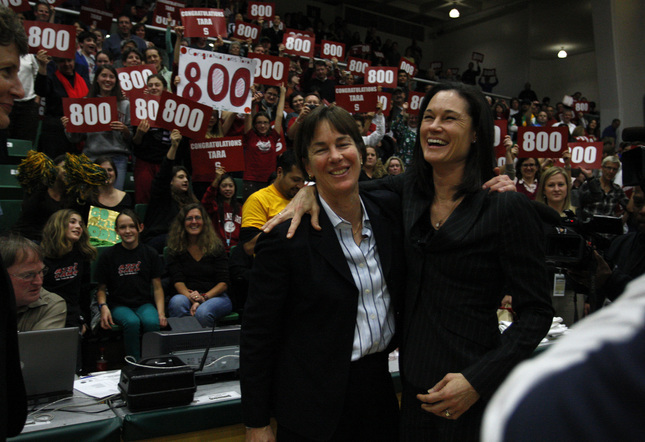 Jennifer Azzi, right, congratulated her old coach, Tara VanDerveer on the occasion of VanDerveer’s 800th career win in 2010. San Jose Mercury News photo. It’s a match-up that the women’s basketball gods couldn’t resist. When the University of San Francisco made it to their first NCAA tournament by shocking Brigham Young University in the West Coast Conference championship game last week 60-58, the chance to pit Coach Jennifer Azzi’s Dons against Stanford became possible. San Francisco will face off against Stanford University Saturday night at Stanford, and Azzi, who graduated from Stanford in 1990, will be looking to upset her former coach and mentor, Tara VanDerveer. The Cardinal comes into the tournament seeded fourth in the Lexington Region by virtue of its third place finish in the Pac-12 this year and an overall record of 24-7. San Francisco, meanwhile, has had its best year yet in Azzi’s sixth year at the helm. Despite the team’s 21-11 record, its impressive run in the WCC tournament, where the Dons knocked off the third, second, and first-place regular season finishers, earned it a 13th seed in the Lexington Region. Azzi’s career at Stanford was everything VanDerveer had hoped it would be when she practically stole the Oak Ridge, Tennessee high school star out from under Pat Summitt’s nose in 1986. At the time, Stanford was a losing program and Tennessee was on its way to winning its first NCAA championship. VanDerveer convinced Azzi to come to the West Coast and buy into her vision for building a winner. It was a vision based more on recruiting the best, team-oriented players with talent, as opposed to recruiting talented players with the hope of molding them into a team. A four-year starter at Stanford from 1987-90, Azzi became the first Cardinal women’s basketball player to earn the Wade Trophy, the James Naismith Player of the Year award, and the Honda-Broderick National Player of the Year honor. She was Stanford’s first WBCA/Kodak All-American as a junior in 1989, and she earned the award a second time as a senior in 1990. She finished her career at Stanford with 1,634 career points (eighth), 13.4 points per game (tied for ninth), 191 3-pointers made (seventh) and departed as the Cardinal’s all-time leader in career assists (751) and steals (271). In the 1990 National championship game against Auburn, played in Knoxville, Azzi was held scoreless in the first half but took over after halftime to lead Stanford to a 9-point win. Azzi was named the tournament’s most valuable player. Azzi played for VanDerveer again and earned a gold medal as a member of the 1996 Olympic team (which will be honored at the Women’s Basketball Hall of Fame induction ceremony this June). She was a founding member of the American Basketball League’s San Jose Lasers team in 1996 and she also played four seasons in the WNBA. Whether those hard-working kids can pull an upset against Stanford remains to be seen. But for Azzi, it’s another rung on the ladder in the process of building a winning program. And in showing her kids how much fun winning can be. ← Black Bears on the brink of an NCAA bid?